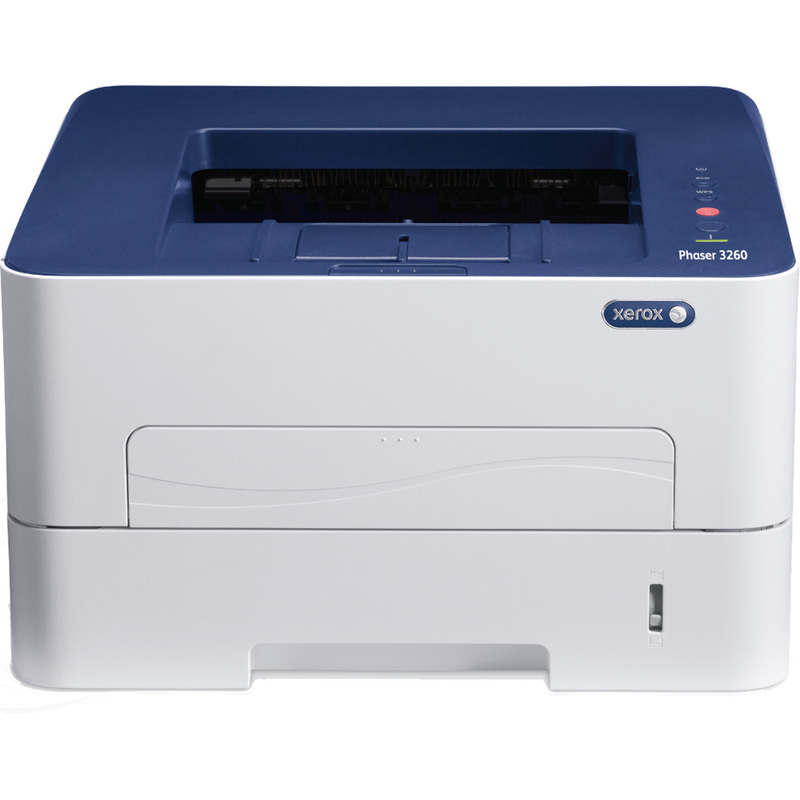 The Xerox Phaser 3260DNI is a high quality laser printer that is well suited for almost any small office workgroup looking for dependability. This printer has added wireless capabilities, toner saving mode, booklet printing, scaling, edge enhance, brightness adjustment, eco-friendly features and more. Useful features, such as an intuitive and simple control panel, make this printer great. Unfortunately, paper handling capacity is relatively low on the Xerox 3260DNI. A Xerox 3260DNI weighs 7.6kg and measures 368 x 335 x 214mm. It features a number of simple and useful buttons. It is compact in size, so it fits in almost any office. The colour scheme is white around the outside, with the well-known Xerox dark blue on top, where you will find the paper output. The paper tray in the front is easy to load and has plenty of capacity to avid constantly having to reload. The Xerox Phaser 3260DNI prints at a very good print speed of up to 28 ppm. The duty cycle is excellent for a small office, at up to 30,000 pages per month. Wireless connectivity and mobile printing add convenience. The excellent print features, including booklet printing and poster printing, make it ideal for producing professional documents. Print and copy resolution are flexible, with a standard resolution of 600 x 600 dpi and up to 4800 x 600 with enhanced image quality. Automatic, double-sided printing makes this printer cost-efficient and eco-friendly, since this saves money and paper. It is unfortunate that the paper input capacity is lower than that of other printers. The paper input of the main tray handles up to 250 sheets, including custom sizes. The manual feed slot allows for only one sheet, including custom sizes. This machine is not multi-functional. It would be good if this printer included additional features, such as scanning and faxing capabilities.